Money can’t buy you love, but in campaigns, it can buy you lots of other things: attention, status, respect, advertising, mailers, staff and headlines. There was a time long past when reporters didn’t pay much attention to fundraising totals, because reliable numbers were hard to find. Now that they’re all online, there is a flood of campaign fundraising stories. Polls and the amount of money raised are about the only objective data we have to assess support and the ability to mount a successful contest. The candidates with the most money don’t always win. But they win most of the time since they often happen to be incumbents. An incumbent in any office with solid money in the bank, high name recognition and low negatives will win. Then there are the races for open seats with no incumbents. We’ve got a lot of them this year, and in most cases, the candidates are less well known than the incumbents. That’s even true for the top Democratic candidates to succeed Gov. Martin O’Malley — Lt. Gov. Anthony Brown or Attorney General Doug Gansler. Brown has $7 million in the bank, a $750,000 cash advantage over Gansler’s $6.2 million, but that’s only 12% more. Both of them have the kind of money to mount the sort of advertising campaign that could produce one of the most negative primaries in recent Maryland history. Senate President Mike Miller suggested from the rostrum this week that Gansler might consider getting out of the race. Fat chance. The attorney general’s aggressive reaction to negative stories in the fall shows that Gansler does not shy away from a fight. Miller also told the Senate he gave Brown some advice on how to handle the health exchange disaster. Brown didn’t take the advice. At the Senate committee hearing, Brown rejected Republican Sen. Allan Kittleman’s suggestion that he apologize to Marylanders for the health benefit exchange problems. Kittleman did it for him. That exchange is the video clip that made MPT’s State Circle program Friday night. Unlike the stories in the fall about Gansler’s driving and the underage drinking at a beach house, the problems with Obamacare will be an ongoing story. So far, it looks like Brown was not really in charge of the fiasco at all; that’s problematic because he was supposed to be. Speaking of State Circle, I appeared in a 3-minute segment at the end of Friday’s show, and I gave out an incorrect figure for Harford County David Craig’s fundraising in his campaign for governor. He has three times more on hand than I said, but it is still only $182,000. Democrat Heather Mizeur, from her party’s left wing, has raised four times as much as Craig, and twice as much all the Republicans combined. Wealthy Republicans don’t like to part with their cash, especially when they think it is unlikely a candidate can win. This means there was no way to compare his money with others in the race, but he has probably already been working the phones since then to gear up for the contest. With Craig’s background as Harford County mayor, delegate, senator and executive, he has the most experience in government of any candidate in the race of either party. But Craig seems to be running the campaign in the same low-key manner he won those other local offices. The huge crowd for Hogan’s non-announcement announcement in November showed he can generate enthusiasm and support. He may eat Craig’s lunch. Del. Ron George has been running hard across Maryland, but his campaign coffer is running on empty, with just $10,000 left from the $136,000 he raised last year. Charles Lollar seemed to generate a lot of early enthusiasm for his gubernatorial run, but raised a paltry $65,000 in 2013. There are numerous first-time candidates for the House of Delegates who have raised more than that. 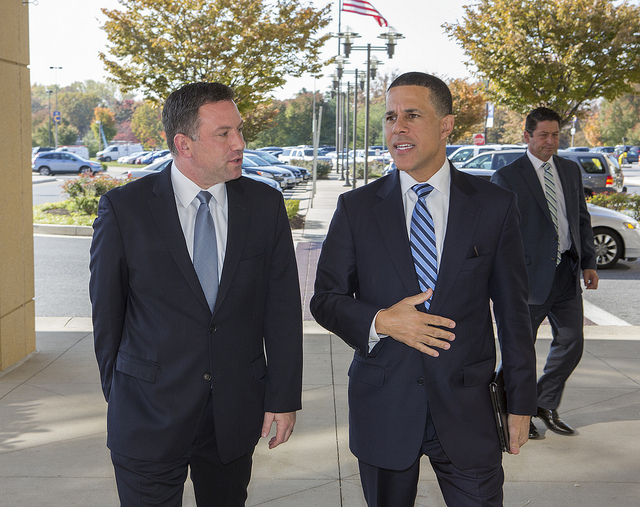 Lollar’s campaign is toast, but he might make a good running mate for Hogan. Two of the four Democratic legislators running for attorney general are in the same boat as the Republican hopefuls for governor, and they aren’t allowed to raise another dime until April 9, the day after the legislature’s closes. Del. Bill Frick, a Harvard Law School grad at a prominent Washington law firm, has $133,000 cash on hand after raising $110,000 last year. Del. Aisha Braveboy has only $20,000 in the bank and raised $33,000 last year, hardly enough for even a delegate race. They’ve been plugging away for a year, but these two candidates are little known outside their own districts, and they do not have the resources to make a statewide campaign. Sen. Brian Frosh, the oldest and most experienced candidate as 12-year chairman of the Senate Judicial Proceedings Committee, has almost $800,000 in the bank, and a slew of union endorsements, more than twice Del. Jon Cardin’s $374,000. But the real question is how much the Cardin name is worth in a Democratic primary when Uncle Ben is not on the ballot. $1 million? How many Democratic voters will know the difference between U.S. Sen. Ben Cardin just re-elected to a second term after 10-terms in the U.S. House and his delegate nephew Jon? Does Frosh have enough money to introduce himself to voters and make the case against Jon Cardin, who got CORRECTED 9:20 1/20 25% in a fall poll, compared to 13% for Frosh? The Republican candidate for attorney general does not exist at the moment. The party is still searching. Reprising his 2010 race against Comptroller Peter Franchot, Bill Campbell, who lives the next street over from me in Columbia, does exist as a candidate, but just barely, with only $3,000 in the bank. Franchot raised $185,000 last year, but has $1.4 million in the bank, reflecting money raised in his aborted campaign for governor. Spring campaign finance reports — the next reports to be turned in to the Maryland Board of Elections — are due April 15. Bill Campbell has been the chief financial officer for the U.S. Department of Veterans Affairs, for the Coast Guard and for Amtrak, and now he’s looking to become CFO for the state of Maryland.